The FacCie is the facilities committee of TSAC. The FacCie maintains the climbing equipment, literature and the climbing walls. Naturally there has to be enough climbing equipment so that all members can climb whenever they want. We purchase new equipment and write off of the old. If you want to go climbing but don't have your own equipment you can borrow some from us. Read the borrowing conditions carefully before you make a reservation. The TSAC has shelves full of climbing books you can borrow and which are regularly updated. We also an extensive collection of topographical maps and guidebooks of climbing areas we visit frequently. Should you have purchased a guidebook during your holiday and we don’t have it yet we might even want to buy it from you. 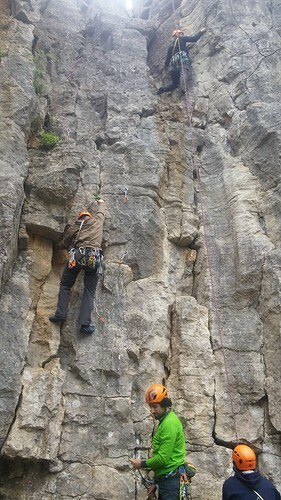 We regularly set new routes on the artifical climbing wall and organize special route setting courses. If setting up routes appeals to you just send us an e-mail. FacCie is also responsible for cleaning Truus, as wel as the maintenance of the boulder wall and the campus board. Should you have any questionsor want to help us and become a member you can always contact one of the people listed above or send us an e-mail at faccie@tsac.alpenclub.nl. For more information about routesetting, see the routesetting guide.